If "the youth" came out en masse for Corbyn how do we square that with the fact that young people overwhelmingly voted Remain? 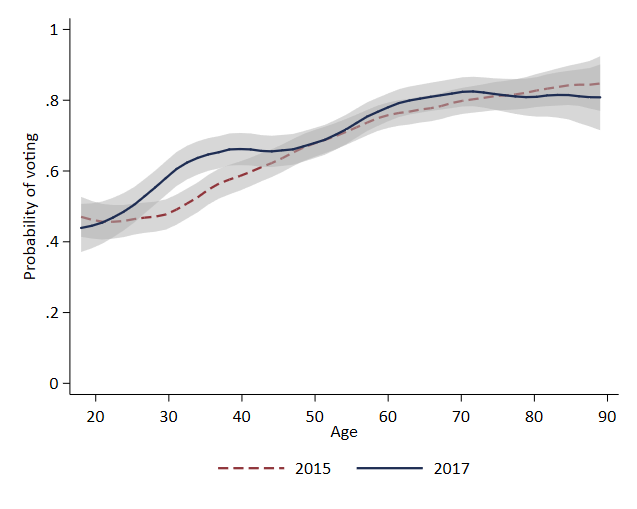 A modest, though statistically significant, increase in turnout since 2015 among voters aged between their late 20s and late 30s (still nothing like the turnout in this or any other election among the over-60s, mind), but little change among voters younger than that, and if anything a sight decrease in turnout among voters aged 22 and under. so who did the Russians back in the UK GE, seems unlikely they would not have bothered? Given the choice between Tories and a Corbyn-led Labour, I can't see any reason they'd prefer the former. Last edited by Mr. Tea; 19-02-2018 at 11:48 AM. Doesnt Corbyn's public ambivalence on Brexit, and secret Lexiteering place him close to that camp? Last edited by sufi; 19-02-2018 at 04:47 PM. Last edited by sufi; 29-04-2018 at 03:17 PM. Yeah, and last week the Times' front page was 'Jeremy Corbyn's hate factory' because some people said bad things in facebook groups he has no control over or input to. 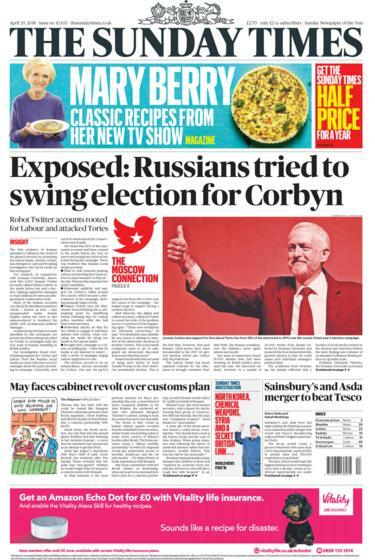 The fact is the British media is completely untrustworthy when it comes to Corbyn (who has been vocally in favour of swingeing attacks on Russian money in London, remember), especially a few days before local elections. I do wonder whether the Windrush 'immigrants' scandal is doing the Tories as much harm as the anti-Semitism thing is doing to Labour - to the extent that these things can be quantified. I mean, it certainly should be. Last edited by Mr. Tea; 29-04-2018 at 08:59 PM. Are you seriously suggesting that a coordinated racist campaign to deport thousands of black British citizens under false pretences should be treated with the same seriousness as an ambiguous one line comment under a facebook post from 6 years ago? Alignment with the Murdoch press is usually not a gloatable scenario! And are you seriously suggesting one comment on Facebook is the extent of the "Labour anti-Semitism thing"? That article mentions Moise Postone's ideas taking hold in the German Left - would love to know what that looks like if anyone knows. I don't find the "Russian bots for Corbz" that worrying or convincing for a couple of reasons - the first being as Droid says, The Times absolutely has it in for him. Second, Bill Browder said that Putin/Russia has no strategy as such with these, it's just about the spread of chaos. I can imagine that backing any other candidate that'd upset the applecart as well as JC- it's not proof of any kind of Corbynite deep links. "Bots 4 Corbz" is almost to be expected, in this context. The third is because I'm absolutely aware of how personally popular he is, amongst so many people I know, in my age group and younger. We don't need the bots to explain this - and I think to a degree you look silly trying. There are genuine reasons for his popularity (though I do wonder to what degree it'll wane, the more people get to see of him). Last edited by DannyL; 29-04-2018 at 09:46 PM. Exceptionally small sample size I admit but it really has not taken long for JC fans I've argued with online to start talking about the Rothchilds or George Soros. Maybe i've been unlucky. There was a post a week or two ago on the J4PM Facebook group telling people to cut it out with the conspiracy theories and memes - the reaction was interesting to say the least.